The piano was being played furiously. Drops of sweat ran down a Lupe's face as she pounded the keys and listened to the music. Generally her music was soothing, but today it was fast and frantic; it sounded anxious and made the Lupe even more upset. The owner walked in. "Don't kill it," she told her pet kindly. Her voice was soft and comforting, but the Lupe didn't pay attention to the tone. All of her resentment right now was directed towards her owner; she immediately turned to the tall, blond girl. "I'll kill it if I want to! You killed my life," the Lupe said, fighting tears of anger and deep sadness. The owner looked away, not wanting to look her pet in the eyes. The Lupe's glare intensified, making the owner shiver. "I only did what I had to, Uki..." murmured the owner, sighing. It was the umpteenth time they had had this conversation, and still the Lupe chose to treat the owner as an adversary instead of a family member. Uki gritted her teeth and looked away, slamming down the keys as she ran her paws across the piano. "You didn't have to, Olivia, and you should know that. He was my older brother. And you let go of him." Uki's brown eyes flashed. She twisted around to stare intently at her owner, scrutinizing her and giving her a once-over. "You can't really believe that, can you? There are free foods out there, and it's not like we're short on neopoints." The Lupe snorted defiantly. "We're rather rich; you were able to paint me pirate." "W-well..." Olivia started, at loss for another retort. She swallowed hard. "I guess I know I shouldn't have done it. But it can't be undone; the pound is down and we can't get into it." Uki growled. "You knew that when you abandoned Gengrich. Dr. Death led you into a room and you just gave him away. You couldn't imagine how that makes him feel. But I can." Uki herself had been in the pound for quite some time. As a blue Lupe she had remained in there and let loose when Olivia had adopted her. At the time Olivia had seemed caring, considerate, and helpful. How wrong first impressions could be. At the time Uki had never known that Olivia could bear to abandon anyone. But she had. And it had been Gengrich. "He was my older brother, Olivia. He understood how I felt when I came home from the pound to find a sibling. He understood how I felt after I was painted. He understood how I felt when you left home for days on end. And now he's gone, because you let him go, and he's locked up in a cage forever. At least, until the pound is reopened. You can't just expect him to accept the fact. A shadow Gelert would be gone in a second if the pound were open. But it isn't, and he's locked up for a long while. And you'll never know how that can make someone feel. Unwanted. Uncared for. Unloved. And now I'm even gone from his life, and maybe he thinks I'm just like you are, and I've forgotten him already..." Uki was sobbing now. "I think a part of me is missing without him, Olivia. He was wise and strong, and completed me. He was my brother. But you just dumped him like he was a piece of rubbish. And I don't know why." The Lupe choked on her tears. Olivia nodded thoughtfully. "Would you like a new brother?" This provoked the angriest response from the Lupe. Her eyes narrowed, and she bared her teeth in a ferocious snarl. "No! I'd never betray Gengrich! Even if you did, I'd never! Maybe Gengrich thinks I have, but I haven't, and I'll never! Gengrich is the only brother for me!" Olivia left the room, softly shutting the door. From the room came floods of angry, sad music. Three days later, Olivia went out and got a baby Lupe. Uki screamed when she saw him. The baby Lupe, interested, began to scream as well. Olivia sighed and yelled at Uki for frightening the baby. "This is your new brother, Uki. His name is Ky. You have to be nice to him, even if you don't like him. But you will. I got him just for you!" Olivia yelled over their screams. Uki stopped screaming and ran to her room, slamming the door. Ky looked up at his new owner. "She no like me?" Ky asked sadly. Olivia shook her head. "Of course Uki likes you, she just needs some time. Some neopets are like that." Ky's eyes were depressed and wide. "She no like me. You wrong." The baby Lupe started to wail. Olivia rolled her eyes. "Go on and play, Ky; you can't expect Uki to like you right away. She just lost her other brother." "Oh," Ky whispered, seeming to accept her answer. He ran upstairs to floor two of the neohome and began to play with his Judge Hog action figure. "Kapow!" he whispered. "Evil be done no more. Justice for Neopia!" The baby Lupe sighed. It wasn't any fun without anyone to play and talk with. His ears drooped. Then they perked again. Ky had made up his mind. He was going to his sister's room. Uki's room was across the hall. The baby Lupe knocked loudly. Over music, a tearful voice called, "Come on in." Ky opened the door and walked inside to find his sister playing the piano. He climbed onto her bed and sat. "Why don't you like me?" Uki refused to be rude to her new sibling. This was all Olivia's fault, anyway; Ky had done nothing wrong. She turned to him. "Would you like me to tell you a story, Ky?" The eager young Lupe nodded and waited. Uki started to explain the events of her life. "One day a blue Lupe was entered into Neopia. Her name was Ukisinti, Uki for short. She was me. 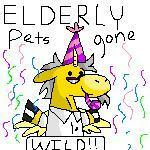 My owner soon decided she wanted to create another neopet, and, since she had four, she let me go. I was entered into the pound and welcomed not-so-warmly by Dr. Death. I was led into a cage and I sat there, unwanted and sad, for many months. Then someone decided to adopt me. That was Olivia. I thought she was kind and wonderful, and would never betray me. We came to a beautiful neohome after I was painted pirate, and I entered to find a brother. My feelings were mixed. I would have to split my owner's love. But over time we bonded. He understood me, and he was wise and smart and gave me advice. I gave him fun and music. He made me a whole Lupe. I was suddenly wanted, by both an owner and my brother, Gengrich. But one day Olivia just sent him away, took him to the pound and left him there to rot. And I realized that Olivia was not the person I thought she was. She had betrayed me, and Gengrich too. And now Gengrich is alone in the pound, and feels unwanted, and maybe even doubts my loyalty to him..."
Ky started to cry. "I like stories that have happy endings," he informed his new older sister. Uki smiled and hugged him. "Maybe this story will," she reassured him. Over the next few months the two neopets bonded, and Uki began to feel as if she were complete again. Nothing was missing now. Ky was smart for his age and friendly, and Uki loved to teach her brother new things. Olivia was pleased by how well they were getting on, but became disgusted with Ky as he ruthlessly destroyed items she had paid many neopoints for. "Why did you have to knock around in here? You broke five things!" Olivia told the baby Lupe crossly. "You're the one who painted him baby." Uki defended her younger brother. Ky nodded assent. Later that night, Olivia and Uki had another conversation. "Olivia, I'll never say that I'm glad you betrayed Gengrich. I still hate you for it. But aside from adopting me, getting Ky was one of the best things you ever did," Uki commented happily, a warm tune playing from her piano. Olivia nodded. "He's awfully destructive..." she murmured, half to herself. Uki looked at Olivia closely. "He's just a pup. Paint him again and he'll change," she advised her owner. Olivia nodded. "You know, Olivia... I feel happy again. I am to Ky like Gengrich was to me. I am his teacher; I understand him. And he gives me joy, playful joy. He's a wonderful sibling," Uki said contently, closing her eyes. As soon as she was asleep, Olivia left, feeling deeply troubled. "Where are we going? Why isn't Uki coming?" asked Ky as Olivia clutched his paw and led him through to Neopia Central, running. "You've been a naughty boy lately. I can't keep up with you anymore," Olivia scolded him. Ky added those things up and flashed Olivia a look of horror. "You're not taking me to the pound, are you? Please no! I can be better, I promise..." Ky's squeaky voice trailed off in uncertainty. "I'll miss Uki." Olivia stopped for a moment and considered. Her blond bangs dangled in front of her eyes. "No," she decided. "You have to go. I want no extra responsibilities." Ky whimpered and covered his face in his paws, and Olivia could hear muffled sobbing. She ignored it. Without even thinking it through clearly, she marched into the pound. "I'd like to speak with Dr. Death," she told the Uni at the front desk. The Uni flashed her a sad look. "He's with a client," she told the angry owner. "In the meantime, you may want to think about it; you shouldn't abandon your neopet." "I've thought about it enough," Olivia retorted. Dr. Death emerged from a door. "You're getting rid of him, eh? The pound is closed. You won't be able to get him back until it reopens." "I'll never get him back. I never want to," Olivia informed the Techo. Ky let out a frightened cry. Dr. Death turned somberly to the neopet. "I'll need some payment," he told the owner. Without complaint Olivia tossed him the neopoints. "And now you come with me," Dr. Death told Ky.
"I don't want to... I want to go home to Uki," Ky protested, sniffling. Dr. Death sighed. "I'm afraid you don't have a choice, kid." "You DIDN'T! You couldn't have!" Uki was pounding on the piano again. Her music was loud and all anger. Olivia flinched. "There you go again, with the lame excuses! Face it, Olivia, you're not the owner I once thought you were. You don't think things through. You're immature and don't want too much responsibility. Well, now I am missing two brothers, and I'm missing a part of myself! I'd rather be stranded in the pound with Gengrich and Ky than here with you!" Olivia shook her head. "I'd never abandon you," she protested hoarsely. Uki closed her eyes. "What other promises will you not keep, Olivia? You'll never learn. Time and time again you give away the pets you once loved so much. And though I'm sure you regret it, there is no eraser in life. You can't undo the past. You can only look to the future. And I'm trying. But I can't see anything but more disappointments." Olivia nodded. "I understand," she muttered. Uki fixed her with a glare. "No, you don't. You'll never understand anybody. You don't even understand yourself. And now a part of me is gone because of it. Locked up in a cage, with my brothers." Olivia looked at her only pet. "If you feel that way, we go to the pound tomorrow," she murmured. Uki nodded. "This I won't regret." Dr. Death led a pirate Lupe to a cage. "Come here, Uki," he told her. The Lupe followed the orders and sat down as Dr. Death solemnly closed and locked the cage doors. Uki strained her ears. "Uki!" came a baby Lupe's voice. A crash sounded; apparently the young Lupe had run into the side of his cage. "Uki!" hollered a deep Gelert voice. "I'm complete again," whispered Uki. Aloud she said, "We stick together, through adoption. Got that?" Neomail me with comments and suggestions.